“Fast fashion has such an irreversible impact on our environment so I wanted to create items that have been born in the field and made on site, thus helping to reduce our carbon footprint on this amazing planet. 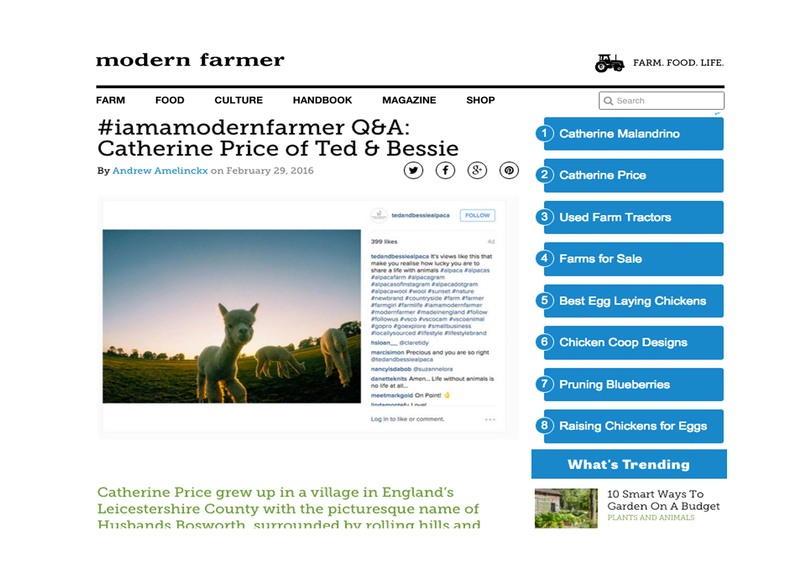 Besides, what better way to spend your days than with alpacas, spinning fibre, and knitting?” she tells Modern Farmer. Catherine Price grew up in a village in England’s Leicestershire County with the picturesque name of Husbands Bosworth, surrounded by rolling hills and farm animals—but fashion and city life called to her. After spending time in Tokyo, earning a degree in fashion, and living and working in London, Price, 26, felt there was something missing—something she found upon returning to the countryside. She was lucky enough to combine her passion for making clothing with her love for the pastoral through her new farm-to-fashion venture, Ted & Bessie. Named for her grandparents, Price’s goal for her fledgling business is to create long-lasting, high-quality garments and furnishings (just like the kind produced back in her grandparents era) made from her small alpaca herd’s fiber. 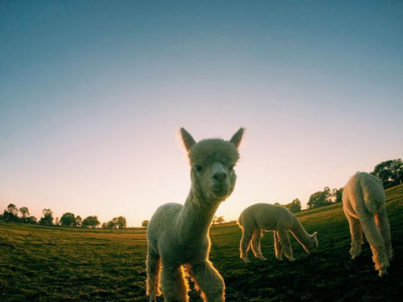 Catherine Price: As the alpaca industry is still fairly new to the UK, with the first major alpaca import arriving on British soil in 1995, the industry is still expanding, and is “modern” in Britain by definition. I believe being a modern farmer means adapting to public demand and people are starting to realize this planet will not last forever—something has got to change. Alpaca fiber in particular has so many wonderful properties that many people don’t yet know about, and our aim is to create on-site luxurious products made from fiber from our own herd. Moreover, if at Ted & Bessie we can produce our goods in the same location that our alpacas are born, we can do our little part in creating a better future for our planet and reducing our carbon footprint. CP: I believe when you buy locally sourced products you are supporting a dream. People go into agriculture because they love the lifestyle, but by “going local” you are also cutting out the middleman, thus increasing profits for all the hard working farmers in the UK; if you know where your products come from, you know exactly what goes into the produce you buy. It is a labor of love whatever the weather and this reflects in the quality. CP: I would love to be able to grow my own vegetables and raise a pig or two. Knowing where your products come from is peace of mind they have had a good life—although I get very attached, so would end up with a very large farm and a diet purely consisting of veg! Perhaps not a bad thing. CP: Potatoes are excellent. They are so versatile—not many vegetables can say they can be made into chips, mash, roasties, and crisps! CP: Anyone who says they can do this on their own is either lying or possesses a super power. I am so grateful to have such supporting parents and an amazing partner who have helped me rebuild shelters when they get destroyed in the wind, or hold an alpaca or four while clipping their toenails! The breeders we got our first four alpacas from have been an invaluable wealth of knowledge; it was important for us to start with good animals and we couldn’t have purchased them from a better source. Be kind to the people that are there to help —they really are imperative, so appreciate them. CP: If it wasn’t for the incredibly dedicated farmers in the Andes who have been raising alpacas for many years, we never would have been fortunate enough to have such wonderful animals in our country, and I never would have been able to start this business. I am grateful to those who have dedicated their lives to producing these marvellous fluffy animals and to all of the lovely people in the alpaca community who are always happy to answer even the most ridiculous question!